March 2014 Note: Josh has a reboot of this piece here. Are you a freelancer? If so, your third-quarter taxes are due on September 17. Are you freaking out? Do you have a big bill, but aren’t sure where the money will come from? Do you have no real idea how much the payment should be? I cannot help you with your third-quarter payment. But I can help you avoid future shocks. Once, long ago, I was like you, and I had to unexpectedly pay $1,500 to The Man, and I swore with God as my witness that I would never be startled again like that. The key is, rather than panicking at large bills four times a year, you’re going deal with much more manageable bills once a month. I’m going to work on the assumption that you find math and numbers terrifying. I’m going to start by giving you step-by-step instructions, which contain a certain amount of arithmetic; I swear to you that it will be nothing you and a calculator can’t handle. Once we’re done with the steps, I’ll try to give you some context to explain why you did what you just did. But you don’t have to understand why! You can just follow the steps and do what I say and trust me, your life will be better than it is now, when you’re freaking out about how you’ll make your quarterly payment on September 17. • An accurate accounting of how much you’ve made as a freelancer this year so far, plus how much you’ve paid already in tax estimates. • Someplace to stash estimated tax money that’s separate from whatever checking and savings accounts you usually use. This can be anything from an online account with ING Direct to a coffee can in your sock drawer, so long as you hold to the mindset that money in this spot is only for tax estimates and nothing else. Step 1: Take the amount of money you’ve made freelancing so far this year and divide it by the number of months that have passed so far this year. (Feel free to use half-months, e.g., on September 17, 8.5 months have passed so far.) Then multiply the result by 12. This is your estimated annual income. Step 2: Multiply your estimated annual income (the result from Step 1) by 0.1413. 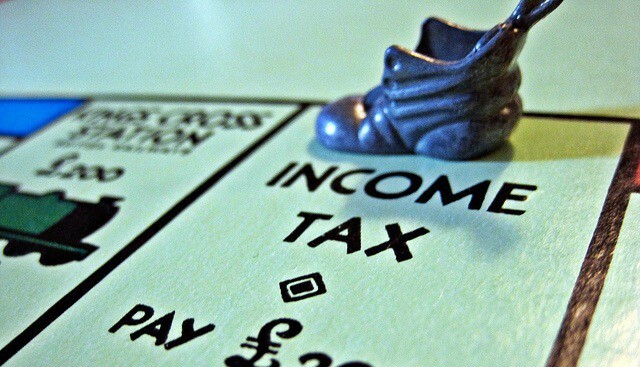 This is your estimated self-employment tax for the year. Step 3: Take your estimated annual income (the results from Step 1), and subtract half of your self-employment tax (the result from Step 2). Take the result and subtract either $10,000 (if you’re single) or $20,000 (if you’re married filing jointly). This is your estimated taxable income for the year. Step 4: Use the chart below to figure out your estimated income tax for the year. This is taken right out of Form 1040ES. When it says “Line 5” it means your estimated taxable income for the year, aka the results of Step 3. Step 5: Add together your estimated self-employment tax (the results from Step 2) and your estimated income tax (the results from Step 4). This is your total estimated tax for the year. Divide this by 12, then multiply that by the number of months that have actually passed this year. This your estimated tax liability so far this year. Step 6: Subtract your estimated tax liability so far this year (the results from Step 5) from the amount you’ve already paid in quarterly estimates (if any). This is the amount you should have in your special account right now. Step 7: Subtract the amount you actually have in your special account (if any) from the amount you should have in your special account (the results from Step 6). Move the difference from wherever it is you usually keep your money into your special account. Step 8: Repeat this process once a month (or, if you’re feeling really ambitious, twice a month). Remember, every time you do it, start with the full amount of money you’ve made for the whole year so far, not just the amount since the last time you estimated your taxes. Step 9: Whenever it’s time to make your quarterly payment, just write Uncle Sam a check for the amount that’s in your special account (obviously you’ll need to move it from your special account to your checking account). The due dates, addresses where you send the checks, and voucher forms to fill out are all in Form 1040ES. Well, if you had an employer, they’d be taking money out of your check every other week to pay your taxes. By setting aside money in a special account once or twice a month, you’re basically doing the same thing. That way you’ll avoid the need to scramble for money four times a year, and instead will be making smaller, more manageable payments. No, I got that. I mean, what’s with all the crazy math? Why can’t I just start with however much I made and just set aside 20% of that, or however much I owe? Well, the problem is that there’s no way to know however much you owe without doing this math! The reason this so complicated (even this super stripped-down version is nine steps!) is that progressive taxation is complicated. Remember when pizza-man Herman Cain was wowing America his “9–9–9” tax plan? Under President Cain, this whole process would be incredibly simple: just take whatever you’ve earned so far and multiply by .09, then set that aside to pay to the government. The problem is that this isn’t really fair. A 9 percent tax rate is much more burdensome on someone making $20,000 a year than it is on someone making $100,000. The way you make it fair is a progressive tax system, which means that the more you earn in a given year, the higher percentage of your income you pay in taxes. But that means that, in order to figure out how much you owe in taxes, you need to know not just how much you’ve made, but how much you’ve made over how much time. If you’ve made $30,000 over six months, you’d need to pay more than if you’d made $30,000 over a year. The IRS’s suggested solution to this problem is simple: estimate at the beginning of the year how much you’ll make freelancing, figure out your taxes based on that, divide by four, then pay that amount four times a year. The problem with this, as should be immediately obvious to anyone who freelances, is that in January you generally have no idea how much you’re going to make freelancing over the next twelve months. If you overestimate, you’ll be left with payments too large for you to afford, and if you underestimate, you’ll be faced with an unexpectedly large payment once you fill out your 1040 the following spring. The system outlined here estimates your annual income, based on what you’ve earned so far, multiple times a year. This means that your payments will be more in line with what you’ll really owe, and will be more affordable. Are you leaving anything out? The most important thing I’ve left out is state income tax. Unless you live in one of the nine states colored red or yellow on this map, you should in theory be estimating your state taxes along with your federal taxes during this process. Unfortunately breaking down the math for each of the other 41 states would make this article completely unwieldy. State taxes are generally simpler than Federal taxes, if you’d like to make a go at adding that math to the mix yourself, and substantially lower than Federal taxes (my state prepayments are usually only about a quarter of my Federal prepayments, and I live in Maryland, a relatively high-tax state) if you feel brave enough to put off the payments to once a year. But if you’re really anxious to figure your state taxes but feel at sea with the math, please email me and I’ll try to help. We’re all in this together! Beyond this, there are some extra steps you can add in to make these estimates more accurate. Probably the easiest one: you can deduct your health insurance (if you’re buying it yourself on the individual market and not getting it through a spouse or parent’s group plan) and any contributions you make to your SEP-IRA and SIMPLE plans from your taxable income for the year. Keep track of what you spend in this way over the course of the year, then extrapolate them out to an annual amount (divide by the number of months in the year so far, then multiply by 12), then subtract that from what you get in Step 3. Final word: These rules hold for 2012 only! Every year the tax math changes a little bit, mostly because tax brackets are indexed to inflation. But at the end of 2012 we’re facing the so-called “fiscal cliff”: All the Bush-era tax cuts will expire automatically on December 31. Neither party wants this to happen, but both have radically different visions of how they want to replace them. It’s extremely unlikely that any action will be taken before the November elections, so we probably won’t know what figures to use for 2013 until very late in the year, or perhaps not until early January. We’ll update this article with 2013 math as soon as it becomes available, because you’re going to want to turn things over on a new leaf next year, right? If you find the steps a bit hard to follow in the abstract, let’s try an example! Imagine that it’s August 1, you’ve made $20,000 so far as a freelancer, you’re single, you’ve made your first two tax payments for a total of $3,500, and you’ve got $400 already in your special account. Step 1: Take the amount of money you’ve made freelancing so far this year and divide it by the number of months that have passed so far this year. Then multiply the result by 12. Step 2: Multiply your estimated annual income (the result from Step 1) by 0.1413. Step 3: Take your estimated annual income (the results from Step 1), and subtract half of your self-employment tax (the result from Step 2). Take the result and subtract either $12,500 (if you’re single) or $9,750 (if you’re married) from that. 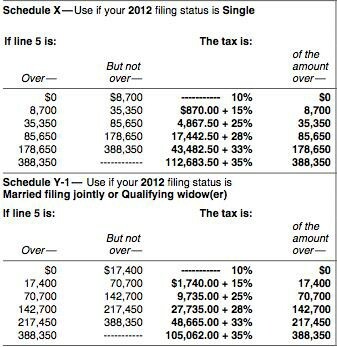 Step 4: Use the chart below to figure out your estimated income tax for the year. Ta da! $366.55 is how much you should move into your special account. Josh Fruhlinger would like to emphasize very strongly that he is not a professional accountant. He’s just a guy who’s been freelancing for 10 years and has done OK for himself tax-wise. He runs the #1 Mary Worth fan site on the Internet, and also has a Tumblr and a Twitter.